Trevor Ngwane is an activist at the University of Johannesburg (UJ), a socialist and a member of the Democratic Left Front. 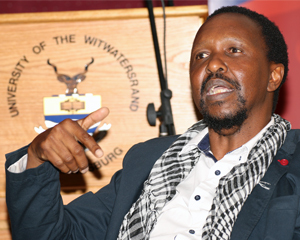 Ngwane studied and has taught sociology at Wits. Wits Vuvuzela caught up with Ngwane to discuss the student movements and more. What do you think is the way forward for the current Must Fall movements that have emerged around the country? I think the students have done a lot to actually take forward the struggle for free education. I think that education is a basic human right and it is a key to building a better society. One of the things that they did was to unite with the struggle of the workers to end outsourcing and to end exploitation on campus. I think they should continue that way. Also they should fight against the elitism of university education. So if they want to criticize Eurocentrism they shouldn’t assume that its hierarchical nature is ok. It shouldn’t be that “we want to be black professors and join the exclusive club of 5%”, we should fight for an equal society. We should fight for an egalitarian society with less inequality. And lastly I think we should fight against racism, but in fighting against racism we should allow those white people who support our struggle to be with us and to join, and to trust that they will do and act and aspire to what we aspire to. Do you think social media is a useful tool for activism and organising social movements? I think social media is a useful organising tool if it is used in a good way. What I don’t agree with is when proper meetings are not called or meetings are called using social media at short notice so that only a few, even if you have a group, if you hear that, it’s like 12 noon “comrades there is a meeting at three”, so I don’t like that with social media. I don’t like when social media allows people to change positions and decisions which have been collectively taken. I also don’t like it when it is used to slander and attack individuals. But I think it is very good to spread the word, to make sure even those who are not interested get to know what is going on. It’s useful when we need to take action and we must communicate quickly. So I support social media, I think it has done a lot. What do you think is the connection between broader worker’s struggles and FMF? There is inequality is society, the rich are getting richer and the poor are getting poorer. The children of the poor end up doing manual work in poorly paid jobs. They never go to university [and] even if they go to university they get financially excluded. But if you look carefully the working class, the poor, there are many ways in which they are financially excluded. They are excluded from eating good food because it is expensive, they are excluded from having good health care because they don’t have medical aid, and they are excluded from moving around because they don’t have money for transport. There are so many ways in which financial exclusion can be extended beyond education. So for the struggle of the students it needs to see and to join up with other financial exclusions, with other struggles, the struggle for water for everyone, for electricity, for houses – nine, ten million people live in shacks, the struggle for health care, the struggle for decent public transport, the struggle for, I can call it recreation, for culture. Poor people, working class people, they have quite limited avenues for cultural and recreational activity. That’s why many of them just end up drinking because it’s the easiest thing which is near to them. Also I don’t think the movement for students can advance very far, I’m not saying it won’t advance at all, without linking up with other struggles in general society, so I’d like to see the student organisations link up with the trade unions, with community organisations, with Left groups. Why do you feel ‘trust’ is an integral part of struggle? Trust and generosity. With generosity I think you cannot have solidarity unless you are prepared to give something of yourself, even when it does not immediately benefit you. Youth should be able to support pensioners fighting for a bigger pension even though it’s another 40 years before they get old. A white person should be able to sympathise and support the struggle of black people even though that white person enjoys white privilege. The employed should be able to support the struggle of the unemployed and the unemployed should be able to support the struggle of the employed. So this is generosity. Trust, we should trust each other. You see there is too much suspicion. “You are too old to support our youthful movement”, “you are too white to support the struggle of the blacks”, “you are too UJ to know about the struggle of the Wits students”, “you are a civil engineer student you don’t know anything about sociology and we in the humanities we know more”. We have to trust that the comrade next to us who says “I am of the movement”, unless they prove otherwise, that they aspire just as us to change society in the way that we desire. I have noticed that often students don’t trust each other, we don’t trust members of SASCO, I’m not saying that sometimes the leaders don’t deserve not to be trusted, but I am just saying rank and file members, SASCO members, PYA members, if they say they also want Fees Must Fall and they are prepared to put their bodies on the line to join, lets trust them. But obviously if they do things that undermine the movement they must censure them. I just want to say one last thing about disruption. I have heard the vice chancellor Adam Habib and also the vice chancellor Ihron Rensburg saying that it is most important that universities must continue without disruption, in a way they are saying that normal life must continue but I must remind them that under apartheid we used to say there can be no normal life in an abnormal society. You know in a society where half the workers earn less than R3000 a month, it’s not normal. So, I think that to defend normality and to fight against disruption, I don’t support it. I think that at some point everything must change and it might entail that we disrupt what is going on so that change can come.